Initiated by Wirtschaftsförderungs GmbH of Landkreis Traunstein, in mid-December a delegation of six participants from Lebanon visited the rural district Traunstein. 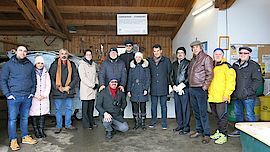 Traunstein’s aim is to establish cooperation with three municipalities in order to promote exchange regarding environmental and energy-relevant topics between the municipalities and the district. The objective of the trip was to find out about the local circumstances in district Traunstein and to take stimuli home to Lebanon. The delegation spent a whole day on waste management and local collection systems. Project manager Sarah Tschachtli took part in the tour of a municipal recycling depot and subsequent workshop in Kloster Seeon, a former abbey. During the workshop the relationships between historical waste management development, market conditions and recycling processes as well as the legal framework were explained to the representatives of the Lebanese municipalities and municipal associations in greater detail. The individual problems of the municipalities in Lebanon were then discussed and initial approaches to solutions were sought.